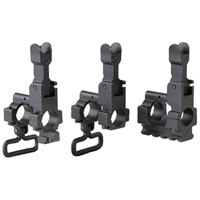 There are two major categories of GAS BLOCK FRONT SIGHTS. The first type is an all in one unit that consists of a GAS BLOCK and some type of FRONT SIGHT. This category can be broken down even further with either a FIXED FRONT SIGHT TOWER or FLIP UP FRONT SIGHT. These are self explanatory. 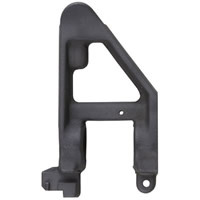 The second type of GAS BLOCK FRONT SIGHT is intended to be installed on a GAS BLOCK that includes a PICATINNEY RAIL. The reason the PICATINNEY RAILED GAS BLOCKS need a special type of FRONT SIGHT is the fact that the rail is not typically on the same plane as the UPPER RECEIVER PICATINNEY. There is two other items worth noting. Item 1: You can purchase a RISER BLOCK that raises the GAS BLOCK PICATINNEY to the same plane as the UPPER RECEIVER PICATINNEY. This would allow you to utilize any same plane BUIS or FRONT SIGHT with one exception that leads to Item 2: DUE to the heat of the GAS BLOCK the MAGPUL MBUS and probably any other polymer FRONT SIGHT should NOT BE INSTALLED ON A GAS BLOCK. Below is the list of sights I researched while researching my 300 AAC BLACKOUT PROJECT.